NASA announced on Wednesday that the space agency is considering building windbots to help researchers explore the atmosphere of gas giants such as Jupiter and Saturn. Windbots are robotic probes built to float in a planet’s atmosphere for long periods of time. NASA representatives gave a statement describing them as “a new class of robotic probe designed to stay aloft in a planet’s atmosphere for a long time without wings or hot-air balloons”. While NASA’s Opportunity Rover has proven to be a great success for the agency’s mission to Mars, the same technology could not be used for Jupiter or Saturn as Mars is a rocky planet and the other two are gas giants with no land for the robot to walk on. But robot developers have made great progress in recent years, and so a group of engineers from NASA’s Jet Propulsion Laboratory (Pasadena, California) have started conducting tests in order to determine whether or not creating a windbot would be a feasible approach. The study is funded by NASA’s Innovative Advanced Concepts (NIAC) program, which has awarded researchers $100.000 to spend a whole year investigating how such a machine would stay airborne and how it would harvest energy for the duration of the mission. Past attempts to send land rovers to explore gas giants have proven to be massive disasters. In the mid 1990s, NASA had its Galileo spacecraft drop off a conventional probe into Jupiter’s atmosphere. 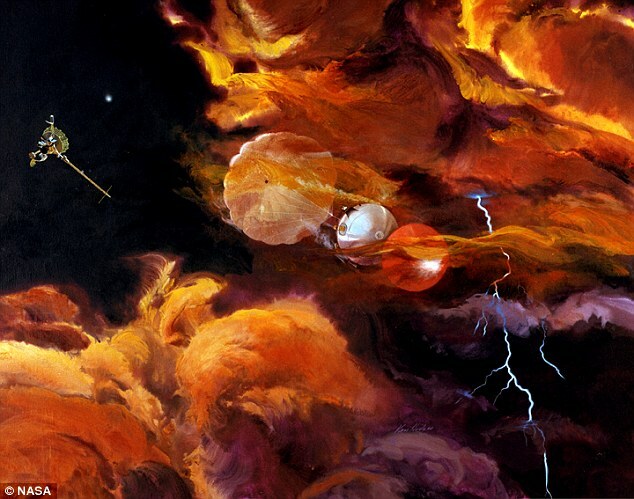 Even though it had a parachute attached, the probe, a battery-powered model, only lasted for roughly an hour before disintegrating due to high temperatures and great pressure as it made its way into the gas giant’s deep atmosphere. But a windbot could be built with rotors on several of its sides. They would spin independently and help it to either create lift of change direction. To give you a better sense of what the researchers are going for, Adrian Stoica, principal investigator for JPL’s windbot study, used an example of something often seen on planet Earth – a dandelion seed. He explained that dandelion seeds do a great job of staying airborne. They rotate as they fall, which creates lift, which in turn allows them to stay afloat for even longer periods of time. They’re simply carried by the wind, and Stoica said that this is the effect that the research team is going to be exploring on its windbot designs. Stoica and his team believe that windbots would have to be able to conserve energy and store energy in the same way that certain modern watches can recharge themselves if the wearer moves their wrist in just the right way. The energy used would also have to come from something that’s already available in a gas giant’s atmosphere, which means that it may not be solar energy since the windbot could spend extended periods of time on the gas giant’s night side. Nuclear power may not be an option either as it could prove to be a liability, but the researchers are looking into the possibility of using temperature variations, winds, and a gas giant’s own magnetic field as potential energy sources. Stoica also stressed that the more researchers will learn about the atmosphere of gas giants, the more that will reveal information about our own planet’s weather and climate. While there are currently no scheduled Jupiter missions or Saturn mission, the researchers hope that their study, should it prove to be successful, will inspire field experts to focus on gas giants.